These terms are sometimes used loosely. In 2016, when Deepmind’s AlphaGo took on Korean master Lee Sedol, media coverage used the terms AI, machine learning and deep learning interchangeably as if they all meant the same thing. Artificial Intelligence is the broadest term, having been coined as early as 1955. It refers to the ability of machines to exhibit human-like intelligence. Current capabilities refer to Narrow AI, which is the ability of technology to simulate human intelligence for a specific task only, such as playing chess. We are still some way from creating General AI, which is computer intelligence that is level with human intelligence across a range of tasks. 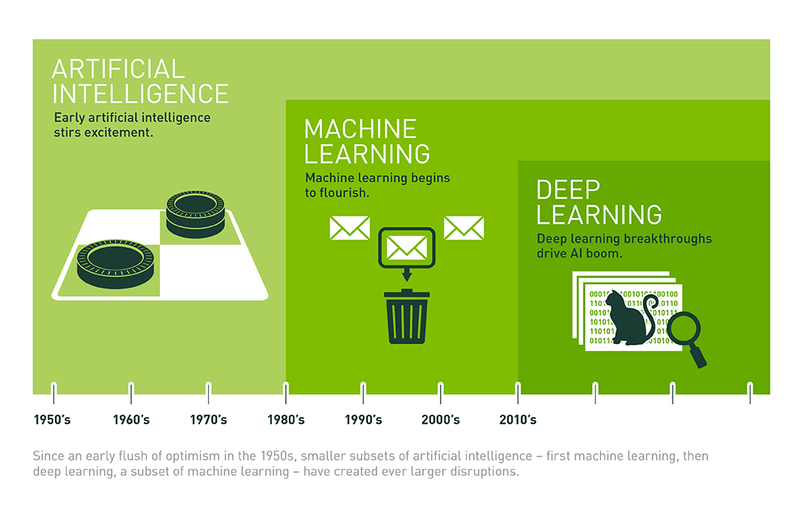 AI encompasses several different technologies and systems of which machine learning is one. Others include natural language processing, computer vision and speech recognition. Machine learning refers to the practice of using algorithms to parse large volumes of data, learn from it, detect patterns and then make a decision or prediction based on these patterns. Deep learning is a subset of machine learning. It is based on neural networks and is a technique for implementing machine learning that has recently proved highly successful. Again, it is dependent on massive datasets to “train” itself. So rather than the traditional method of using conditional coding to capture all possible scenarios and the actions required, the machine is given the ability to learn how to perform the task. So why is AI taking off now? Massive computational power is now available at low cost and can be provisioned in the cloud very quickly. Improvements in GPU design (now with thousands of cores therefore ideally suited to parallel workloads) have increased the training speed of deep learning algorithms by 50x in three years. Big data – there has been an explosion in the amount of data we all create, coupled with near limitless storage capacity. Large and diverse data sets provide better training material for the algorithms. Algorithms are now better at finding patterns in the mountains of data, and AI and machine learning platforms from players such as Google, IBM and Microsoft are making it much easier to develop applications. Investment in AI – in particular machine learning and deep learning – is growing fast. Machines are already as good as or better than humans at some tasks, for example playing games such as chess and go, transcribing audio, analysing images and diagnosing diseases. However, adoption remains low. Business leaders are uncertain about what AI can do for them, where to obtain AI-powered applications and how to integrate them into their companies. Ultimately, the value of AI is not to be found in the models themselves, but in companies’ abilities to harness them. When should I think of machine learning? The decision or prediction to be made is complex, for example face detection, speech recognition, spam filters. You have high quality, clean and recent data, labelled (ideally) to allow the algorithm to make sense of it. Some margin of error is acceptable. Load forecasting. Short term load forecasts are vital for utilities. Machine learning could be used to forecast supply and demand in real time and optimise economic load dispatch. In the UK, Google’s DeepMind has teamed up with National Grid to predict supply and demand peaks and hopes to reduce national energy usage by 10%. Yield optimisation. With AI, power providers can optimise generation efficiency with real time adjustments across their assets. GE Renewable Energy’s “Digital Wind Farm” concept includes software that monitors and optimises the turbine as it runs, increasing energy production by up to 20%. Predictive maintenance can be bolstered with drones for asset inspections, replacing time intensive and risky manual inspections. The drones are trained using deep learning algorithms to automatically identify defects and predict failures without interrupting operations. Demand management can be automated and made smarter with machine learning. In the UK, Upside Energy uses machine learning to manage a portfolio of storage assets to support the grid, while Open Energi controls devices with flexibility in their energy consumption to shift demand in real time. It is estimated that machine learning could be used to help unlock up to 6GW of demand-side flexibility which can be shifted during the evening peak without affecting end users. Energy theft is a huge problem in some developing countries such as Brazil, where theft accounts for up to 40% of the electricity distributed. AI can be used to detect usage patterns, payment history and other customer data that may signal irregular behaviour. Customer insights. Machine learning applications could allow utilities to craft electricity prices that maximise their margins while minimising customer churn. SAP Customer Retention is one of the machine learning applications offered by SAP. AI could also be used to create individual offers and services to help utilities retain their most profitable customers. Energy trading. In this era of the prosumer generating their own renewable energy and sending the excess back into the grid, platforms are emerging to allow peer-to-peer trading between producers and consumers. As supply and demand continuously fluctuate, AI can be used to more quickly match producers with consumers. In the Netherlands, Vandenbron connects consumers with renewable energy providers. Virtual agents will revolutionise call centers, being able to respond to consumer queries and provide instant assistance. They will be able to automatically segment consumers based on service history and provide early warning of bad debts. The development of natural language technologies will eventually unlock the capacity to fully automate customer service. This is something SAP is investing in heavily, with the development of CoPilot and the acquisition of recast.ai. Supplier selection. Machine learning can help customers choose their energy retailer by learning about their preferences – such as energy generation type, how much they’re willing to pay and their consumption patterns – and then scanning the market for the most suitable offers. Lumator, using software developed at Carnegie Mellon University, does this and can also automatically make the switch without interrupting supply. Consumption insights. Meter data can be analysed to extract the consumption profiles of a household’s hungriest appliances and see how much each contributes to the energy bill. Bidgely takes this one step further. Their universal disaggregation algorithm uses machine learning and a database of over 50 billion meter readings from smart meters to extend the appliance profiling to homes without smart meters. AI opens a wide range of exciting possibilities for utilities but the changes will not be simple. Early evidence suggests AI can deliver real value to serious adopters, but current uptake outside of the tech sector remains low. Few companies have deployed it at scale. The opportunities and rewards are waiting for those willing to take the plunge. To learn more about SAP solutions using AI and machine learning, take a look here. Nice and concise overview Gavin. Thanks for the insights, helps to include some of them in the product user stories.